Mr. Schmidt received his B.A. degree from Wittenberg University in Springfield, Ohio in 1967 and his law degree from Duke University Law School in 1973 where was an editor of the Duke Law Journal. He was an officer in the United States Navy from 1969 to 1972, serving as Lieutenant and Weapons Officer on the USS William M. Wood (DD 71 5) at the time of his discharge to return to law school. 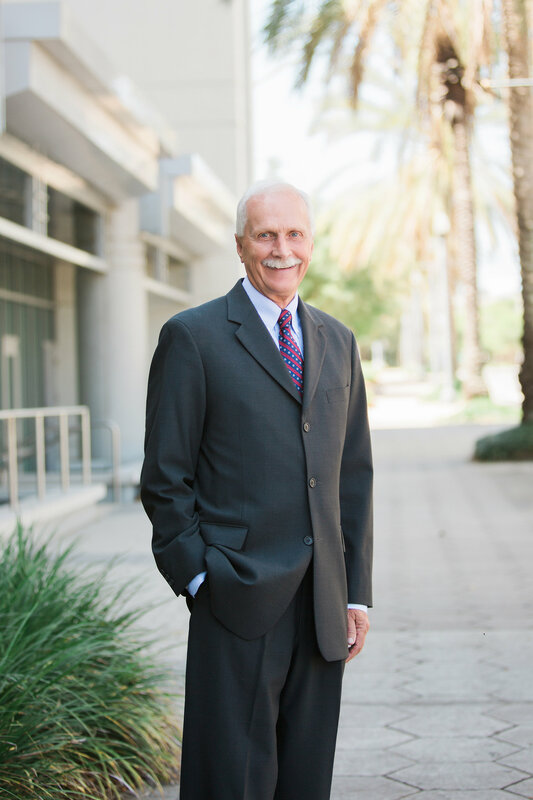 He joined the firm of Mahoney, Hadlow, Chambers & Adams (then the oldest firm in the State of Florida) in Jacksonville in 1973 and became a shareholder in that firm in 1978. On January 1, 1979, he left the Mahoney Hadlow firm to start the firm of Bledsoe, Gallagher, Mikals & Schmidt, the predecessor of the Firm. He has practiced continuously with the Firm since that date specializing in civil litigation. In 1997, he became a Florida Supreme Court certified circuit court civil mediator and a Federal court certified mediator. In 1999, he qualified as an AAA arbitrator and mediator. Since 2001, his practice has been limited to providing alternative dispute resolution services as a mediator, statutory and AAA arbitrator, and special master. EXPERIENCE: I have specialized in litigation since 1974. My practice included litigation in the areas of breach of contract, fraud, employment discrimination, mechanics liens and construction defects, real property, probate, state and federal antitrust and restraint of trade, securities fraud, maritime, bankruptcy, ERISA, CERCLA, RCRA, trademark and copyright, medical and legal malpractice, and personal injury, representing both plaintiffs and defendants. E.g., Jaffe v. Grant, 793 F.2d 1182 (11th Cir. 1986); Woodman v. U. S., 764 F.Supp 1455(M.D.Fla) rev=d 121 F.3d 1430(11th Cir. 1997); VKK Corp. v. National Football League. et al., 55 F.Supp 2d 196 (S.D.N.Y. 1999); Connecticut General Life Insurance Co. v. Jones, 764 So.2d 677 (Fla. lst DCA 2000). I also served as special counsel to The Florida Bar in the F. Lee Bailey disbarment proceeding. The Florida Bar v. F. Lee Bailey, 803 So.2d 603 (Fla.) ce/f. den/ed 122 S.Ct. 1916 (2002). REPRESENTATIVE CASES HANDLED AS MEDIATOR: I have mediated more than 4.000 cases in state and federal courts and for the American Arbitration Association over the past 19 years, including, among others, a breach of contract claim in the telecommunications industry involving a claim of more than $400 millions a commercial breach of contract and breach of warranty case involving claims of over $30 million; a first party bad faith insurance claim for over $25 million; a consolidated action involving multiple securities fraud and negligent supervision claims in excess of $20 millions a dispute between FDIC and a borrower and a subsequent dispute between the borrower and a third party involving real property valued in excess of $20 million; a dissenting stockholder’s rights dispute involving claims in excess of $15 million; a catastrophic burn case involving claims in excess of $10 million; a dispute between a sponsor and a cigarette manufacturer over a NASCAR promotion involving a claim in excess of $5 million; numerous condominium construction disputes involving claims in excess of $5 million; and numerous personal injury, employment discrimination, construction, and other commercial cases involving claims in excess of $l,000,000. REPRESENTATIVE CASES HANDLED AS ARBITRATOR/SPECIAL MASTER: I have been a panel arbitrator in arbitrations involving breach of contract, construction disputes, a cable service agreement, and termination of an insurance agency in which awards were entered. I have also been the sole arbitrator in breach of contract, consumer fraud, employment, construction and Unfair Trade & Deceptive Trade Practices Act disputes in which awards were entered. Finally, I have served as special master and as statutory arbitrator appointed by the circuit court in commercial disputes . MULTI-PARTY DISPUTE RESOLUTION EXPERIENCE: As an attorney representing a party to multi-party cases, I have been involved in numerous multi-party mediations or settlement conferences, including litigation involving antitrust and tort claims filed by a former National Football League team owner against the National Football League and others in which the claimed damages exceeded $450 million; an insurance insolvency case in which the claims exceeded $20 million; an ERISA class action against the trustees of profit sharing plan involving a claimed loss exceeding $10 millions a toxic tort case in which 43 families sued a major waste hauling company and the United States Government for personal injuries arising out of a contaminated landfill which was settled by one defendant for $8.5 million and was tried against the other defendants and construction litigation by a condominium association against the developer, architect, and contractor for damages exceeding $3.0 million. As a mediator, I have been involved in over 500 multi-party disputes involving all kinds of claims, including major construction cases. ALTERNATIVE DISPUTE RESOLUTION TRAINING: National Academy of Distinguished Neutrals (NADN) 8/2012 Advanced Mediation Training Retreats ADR Section of Dispute Resolution (JBA), Fifth Annual CME Seminar (2012, 2013, 2014, 2015); NADN Advanced Mediation Training Retreat 2011; Fourth Annual Institute on Advanced Mediation-Advocacy Skills Training: 2005; DRC 1 3th Annual conference for Mediators and Arbitrators: Framing Our Future, 2004; AAA Advanced Mediator Skills for Court-Based Settlement Program, 2003; ABA Section of Dispute Resolution: New Vistas in Dispute Resolution, 2002; ABA Section of Dispute Resolution Collaboration in the Capital: The Power of ADR Program, 2001; AAA Commercial Arbitrator ll – Advanced Case Management Issues Workshop, 2001; Florida Bar sponsored Private Judges, Mediation and Arbitration Seminar, 2000; AAA Commercial Arbitrator Training Workshop, 1999; Florida Bar CLE Course on Alternate Dispute Resolution, 1998; Florida Dispute Resolution Center, 40-Hr. Mediation training, 1995. PROFESSIONAL LICENSES: Admitted to the Bar: Florida, 1973; Admitted to United States Supreme Court, Ninth and Eleventh Circuit Courts of Appeal, and United States District Court for the Middle District of Florida. PROFESSIONAL ASSOCIATIONS: American Bar Association (Section on Dispute Resolution); Florida Bar Association (Section on Dispute Resolution); Jacksonville Bar Associations Florida Academy of Professional Mediators; National Academy of Distinguished Neutrals; Chester Bedell Inn of Courts The College of Master Advocates and Barristers. bono service as Special Counsel to TFB in the F. Lee Bailey disbarment proceeding. PUBLICATIONS AND SPEAKING ENGAGEMENTS: Speaker, Eighth Annual N.E. Florida CME Seminar for Mediators, “ls There Anyone Who is Not Subject to Cognitive Dissonance… Except Me?” (2015); Speaker, 2nd Annual N.E. Florida CME Seminar for Mediators “Local Issues Facing Mediators and the Ethical Implications” (2009); Panel Member on alternative dispute presentations to the Chester Bedell Inn of Court (2004) and Florida Coastal School of Law (2005); Panel member, Winning Without Trial: The Mediation Roundtables Raymond Ehrlich Trial Advocacy Seminar (2003); Speaker, “The Florida Bar v. F. Lee Bailey: A Cautionary Tale”, Raymond Ehrlich Trial Advocacy Seminar (2002); co-author with Kenneth W. Starr: Inspection Rights of Corporate Stockholders: Toward a More Effective Statutory Model”, 42 Florida Law Review 173 (1974).